Tournament director Marjorie Blackwood congratulates award winners George Leith Murray, left, and Scott Goddard. Portlock Park was the spot for exciting junior tennis play when the Gulf Islands Junior Open took place over the Aug. 25-26 weekend. Salt Spring player Scott Goddard had a great weekend at the boys U12 event, taking down the first and third seeds on his way to the finals where he lost to George Leith Murray from Victoria in a third set tiebreaker (4-1, 0-4 and 7-2). Sixteen players competed in a compass draw format over the weekend, each playing four matches. Salt Springers Sisaye Patterson, Sam Barrett, Ronan Wardroper, Toby Beardsmore and Noah Logan all competed well with players coming from Vancouver, Abbotsford and Victoria. Jag Singh Sanghera of Surrey won third place, defeating Evan Chen from Coquitlam 2-4, 5-3 and 7-4 in a tiebreaker. In the U10 Future Stars event, Charlie Murray of Victoria was undefeated in the group round robin, where Nate Kray-Gibson of Salt Spring performed well with a fourth-place finish. Future Stars events are full court matches using green dot balls for a slightly slower pace. The Sportsmanship Award was awarded to Sam Barrett for showing outstanding character in reversing a call in his opponent’s favour on match point. His gesture was one of integrity and in the spirit of true competition, coming on the final point of a very hard fought match. 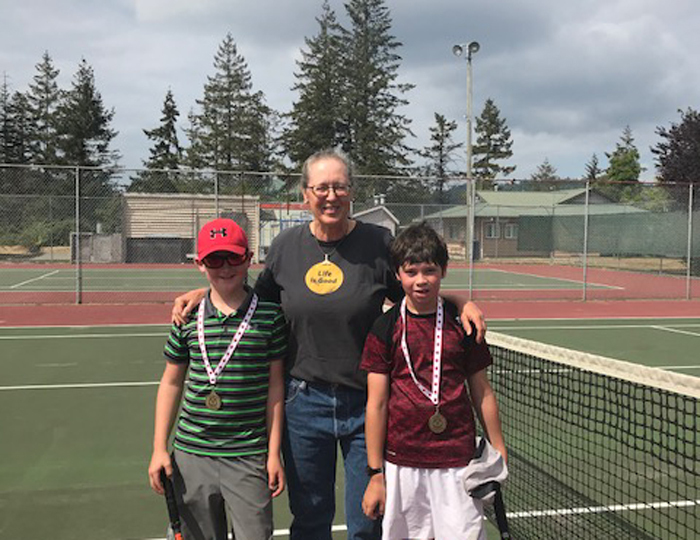 Tournament director Marjorie Blackwood thanked the volunteers and Salt Spring Tennis Association junior committee, PARC for allowing use of the courts, and Country Grocer and Glad’s Ice Cream for contributing goodies for the competitors to enjoy. Blackwood and fellow Centre Court indoor coach Peter Schelling say they are looking forward to expanding junior tennis lessons and events this fall with the addition of a second indoor court ready by Oct. 1.